Those of you that have been reading my posts probably realize the I have switched completely from Classic Gmail to the new Inbox by Gmail. 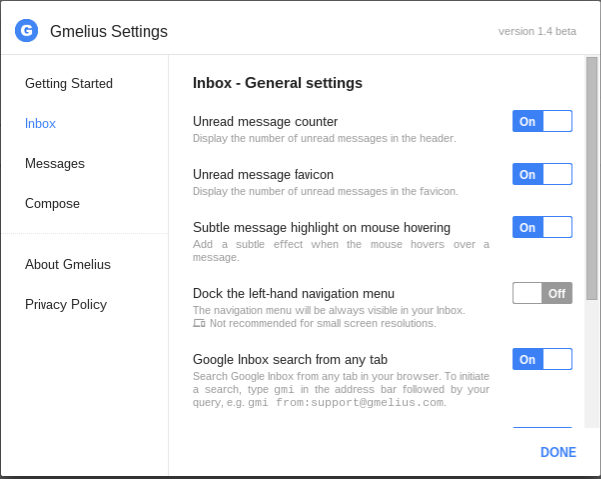 Before I switched, I was very glad to have had the ability to tweak my Gmail experience with a third party extension called Gmelius. I am excited to tell you that the developer has just been working feverishly on an extension for Inbox by Gmail. He publicly announced the beta software this week after pro-user testing starting back in November. The extension can be found in the Chrome Webstore here. This extension currently provides 21 different settings and tweaks to Inbox and can be downloaded in 17 different languages. I have come to use many of these settings, and my favorites include searching Inbox from any tab, signatures, always displaying the format bar, and the always reply in the pop-out compose window. Installation is a simple as clicking on the Add to Chrome button. This will add a few new menu options in the Navigation Menu. 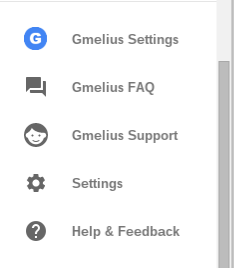 The Gmelius Settings option provide for 21 different settings broken into three categories: Inbox, Messages and Compose. Items marked with (*) are currently my favorite features of this extension. Unread Count in the header - this places the number of unread messages in your Inbox right next to the word Inbox in the header. This is a useful feature for those that are not regularly achieving Inbox Zero, however it should be noted that all unread emails in the Inbox (bundled and unbundled) will be counted. Unread Message Favicon - this places the number of unread messages in the Inbox icon shown in the tab section of the window. The same concern applies here with bundled and unbundled unread emails in the Inbox. Subtle message highlighting on mouse hovering - this is a great feature that provides a subtle grey highlight when hovering over emails. Docking the Left Navigation Menu - this keeps the navigation menu open at all times, saving you the extra click to open the menu and then find what you are looking for. I only use this feature on my 15" screen and my 21" screen. I find it takes up too much screen real estate on my 11" Chromebook. Google Inbox search from any tab (*) - with this feature turned on, if you are in any other tab, you can just enter "gmi" and then search for your email without leaving the tab. You will then be brought to your open Inbox tab (or a new tab will open) and the search results will display. Scroll to top by clicking on header - this is a helpful little option for when you have a lot of emails you are sifting through. Just click anywhere in the blue header (except inside the search box) and you will return to the top of the screen. Hide Hangout Activity - this just hides the Hangout Icon from Inbox - this is a feature I have not found necessary. Hide Google+ Activity - this just hides the Google+ Icon from Inbox - this is a feature I have not found necessary. Easy newsletter unsubscription - this option will detect a newsletter and provide you with an option to unsubscribe. In addition it gives you the option to choose your action: Unsubscribe, Unsubscribe and Delete, Unsubscribe and Archive, Unsubscribe and Mark as Spam. Gmelius read receipts - if you want to send a read receipt to the recipient you will be able to by clicking Ctrl+Y and the read receipt will automatically create and send as part of the conversation view. This feature I personally do not use because I am not a fan of telling people when I read their email. Uniform appearance of incoming emails - this feature takes any fancy email text and makes it standardized as if there was no formatting - this is a feature I have not found necessary. Automatic resizing of large incoming images (*) - this will automatically re-size embedded images that are too large to fit in the width of your Inbox. Skip discard draft pop-up - this takes away the warning message when discarding a draft - this is a feature I have not found necessary. Automatic deobfuscation of email addresses - this feature takes emails posted in forums or elsewhere that are written such as email AT test DOT com and when pasted into Inbox will paste it as email@test.com - this is a feature I have not found necessary. Better compose and reply windows - these changes are extremely subtle and I was only able to find two changes. The From field is displayed as are a couple of separator lines. Always show formatting toolbar (*) - great option that displays the formatting options at all times in a pop-out compose/reply window. It does not display when using the inline reply feature. Always show CC and BCC fields - this toggle removes the need to click to display the CC and BCC fields. Always BCC/CC myself - this is a pretty self explanatory toggle - this is a feature I have not found necessary. Overall the Gmelius extension is a very useful add on to Inbox by Gmail. As I mentioned above there are many features that I use and rely upon, and there are many features that I find are unnecessary for my needs and workflows. However, that is what makes products like this so beneficial as they apply to many people with varying needs and preferences. The developer is extremely responsive and very helpful. In the past 2 days while writing my review, I notified him of a few bugs and they were fixed within hours of notification. Thanks to +Tom Voute for helping me discover some of the changes that Gmelius for Inbox by Gmail provides. Disclaimer: I have not received and compensation from the developer. As of this writing I have not been provided with any free software from this developer in order to write this review. Awesome and detailed post and thanks for having reviewed Gmelius. I added extension for the always show CC & BCC and that is the one and only feature that was no working or not available (greyed out at this time) when I started to select my options. Oh well, almost success!